If it happens that you’ve noticed I’ve been a little MIA this month… then, I know, I know, where have I been?! Well, this past week was spent relaxing beach side with the family. We visited Oak Island, NC, a quaint, quiet, family oriented beach area. Our week was filled with lots of family time, and of course sand, surf and sun. Hopefully, I’ll have more time to share later next week. If nothing else, you’ll have to hear about our dear Ayden getting the fishing net stuck on his head. True story. Mostly, we’ve spent a good part of August frantically working on the Happy Room, making sure we were completed in time for the first day of school. As you may remember, we’re planning to home school this year. Although we could start off the year without an actual classroom, I really wanted to start the year off as organized and ready as possible. It was quite the undertaking – check here for a view of our original disaster quick trip down memory lane. There was so much to do, and although we still didn’t get to painting, we are at least in a much more functional place than we were to start with. I’m happy with our progress! Our goal was, and still is, to provide a space that acted as both a family area and a classroom, as well as a craft room. Creating a dedicated desk area that provided for a sewing desk, as well as a family computer area, was a step in the right direction. Storage was obviously a necessity – we provided inexpensive, not to mention super cute, storage using these file boxes. This provides hidden, decorative storage for nearly the entire room. But, one of the greatest impacts, was a simple makeover in the rooms seating area. Pretty much all of the furniture pieces we’ve had hanging around forever. The futon specifically is a great seating solution in this room, as it is very comfortable, it’s durable and it provides a guest bed when folded down, if needed. It’s also great for sleepovers for the girls! We updated by recovering the mattress in a neutral fabric and adding fun, bright, funky throw pillows. Coordinating fabrics were found on the fat quarter wall at Walmart – $.99 a piece. The bird pillow was really fun – I found an embroidered dish towel at Homegoods. After cutting it down, adding coordinating fabric, voila! An embroidered pillow for $5.99. When time permits, I’ll add a tutorial for this process. The tables in the room were moved from other areas of our home. 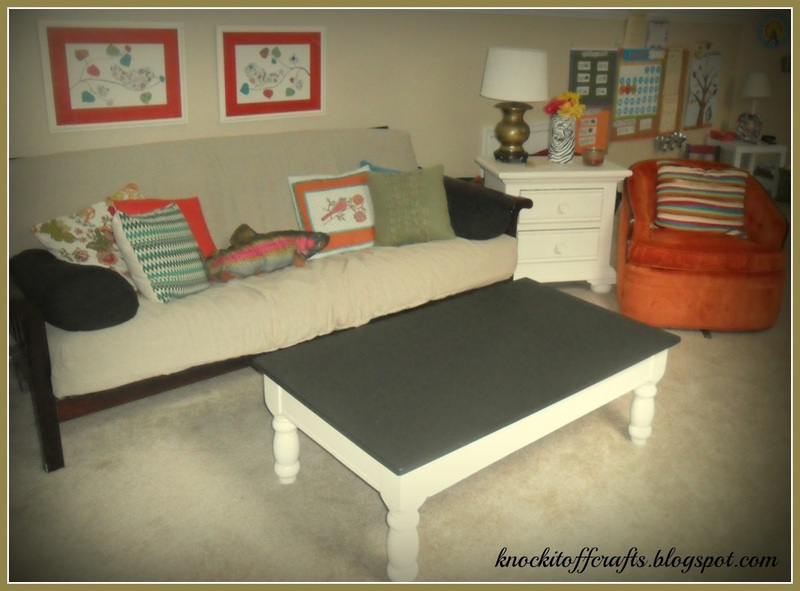 The coffee table received a coat of paint – parchment white on the bottom, and my fave, black suede, on the top. The orange chair, while very worn, was a funky find that once wore a frilly slip cover in my girls’ shared room. We removed the slip cover, and just decided to love on our funky chair as is. The art work was made by me with inspiration from here. The frames, we had. I painted the frames using Rustoleum Ultra Cover Painter’s Touch in Satin Heirloom White and the mats using the same in fire orange. I love, love, LOVE them – they are whimsical and bring a shot of color to neutral pallet of the futon. Tutorial to follow! 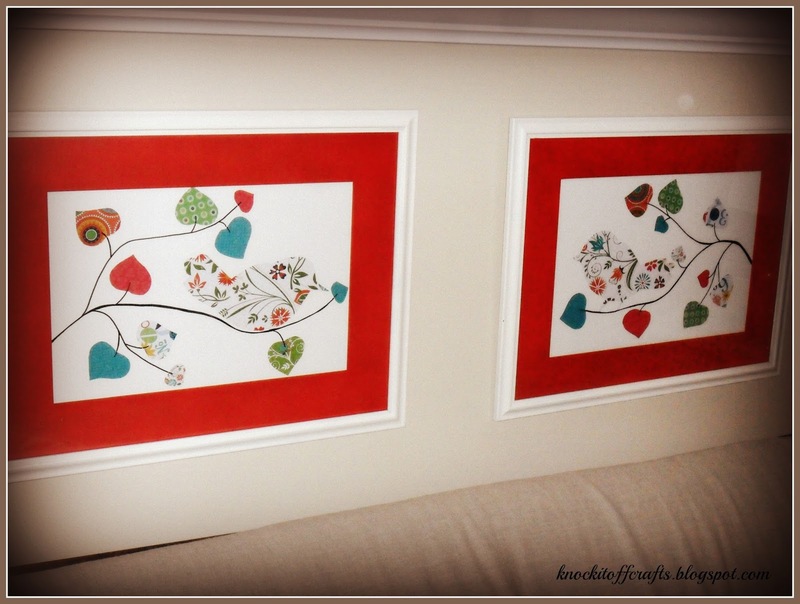 This was SO easy – literally, it took longer for me to find a matching scrapbook pad than it did to make them! All in all, this area is comfy, cozy, and bright. 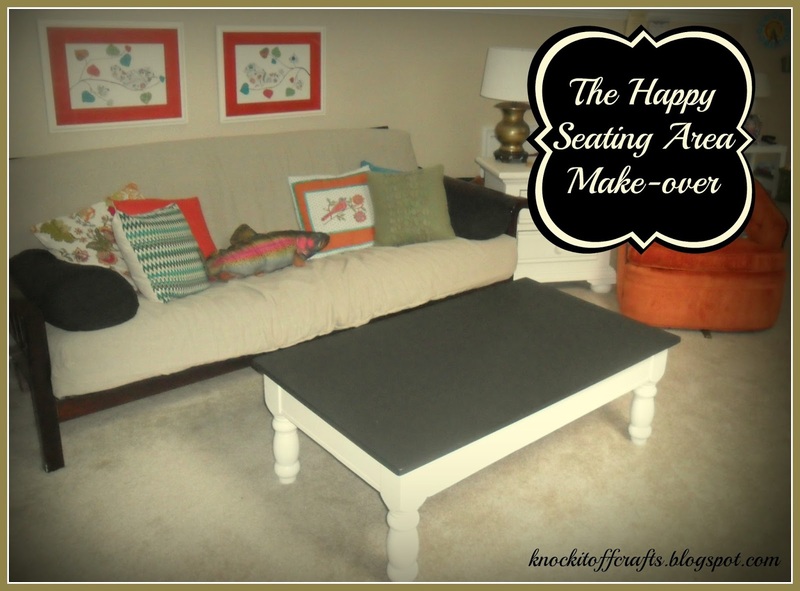 It turned out exactly how I’d envisioned – how often does THAT happen?? Which of course makes me.. Happy. There is more to come – check back over the next few days for more on the classroom portion of the Happy Room! Love the way you tied the orange chair into the decor by repeating the color in the pillows.